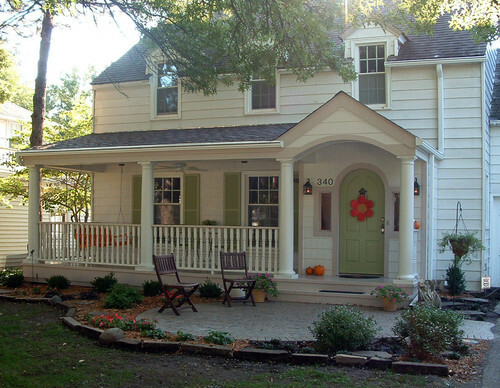 A sure way to make your house stand out from others in the neighborhood is by personalizing the front entry. We’re not talking about adding a bunch of kitsch, but rather incorporating interesting design elements that reflect your style and how you’d like to utilize your front yard. A well planned front entry can be an extension of your indoor living space, but it’s up to you to create an oasis you and your guests will love to hang out in. Here are some tips for things you could do. 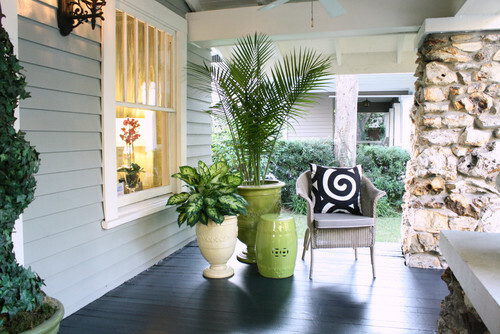 An easy way for virtually anyone to spruce up a front entry is by adding container plants. They have an impact whether you live in a sprawling mansion or a townhouse. Decide between small pots, large urns, and hanging baskets. Don’t be afraid to mix and match shapes, sizes and colors. Lining a walkway with large urns gives potted plants an elevated yet elegant presence. Adding succulents to almost any style of pot adds architectural interest and modern flair. Keep in mind that you’ll need to take down and water the hanging plants unless the planters have a self-watering system. Topiaries are an excellent way to frame a doorway and add height where you need it. Are there pillars for vines to climb? Let them do it from a container and add even more vibrance to your porch. Container plants also provide the opportunity to change contents based on season such as oranges and yellows during the fall and pastels in the spring. Those renovating the front yard are probably overwhelmed by the amazing outdoor lighting options available today. You can create an airport runway look by embedding small lights directly into concrete or stone walkways. 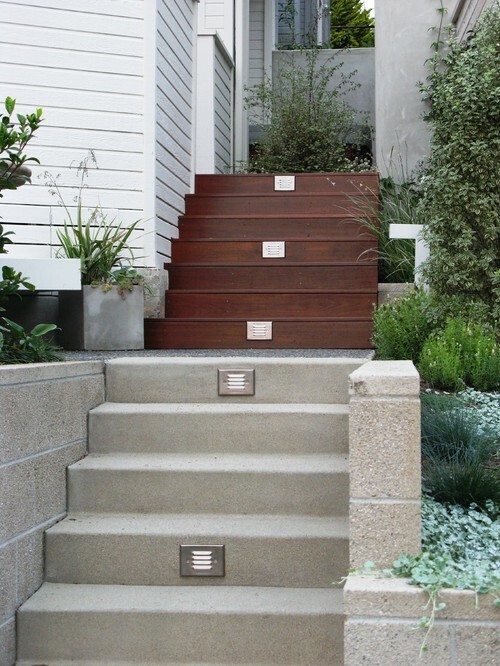 Step lighting prevents guests from tripping and provides a rich ambiance signaling a well thought out design. Flanking the front door with sconces or hanging a drop light are additions can be tied into your home’s electrical system (usually) rather easily with the help of an electrician. If tinkering with wires sounds too overwhelming, solar lights have both come down in price and become much more attractive looking. It’s also not uncommon for rustic-style patios to tastefully utilize small, clear Christmas lights year round as added decor. Sure, a chair or bench on a patio is a fantastic way to welcome guests. 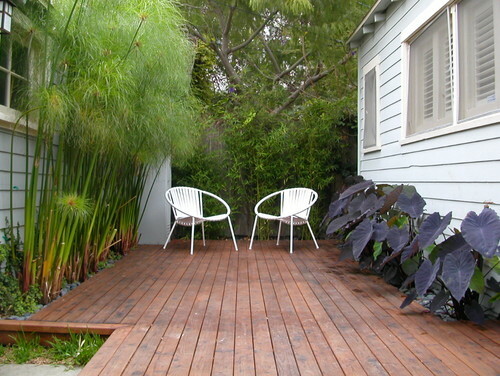 However, your entire front yard is fair game for a sitting area to expand your overall living space. The key is to make outdoor furniture welcoming with pillows that are meant for both comfort and decoration. Complete the look by adding an outdoor rug, a coffee table and even some candles or other accessories. Adirondack chairs are a popular choice for rustic design. 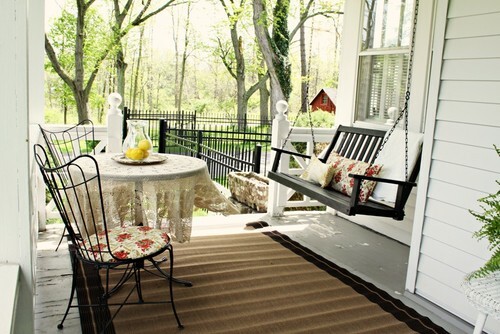 And, if you have the space, why not opt for a good old-fashioned porch swing–a perfect place to watch the kids as the play or relax with a glass of wine. If you already have patio furniture that you like but feel that something is missing, it’s amazing what a difference simply switching out outdoor throw pillows makes. 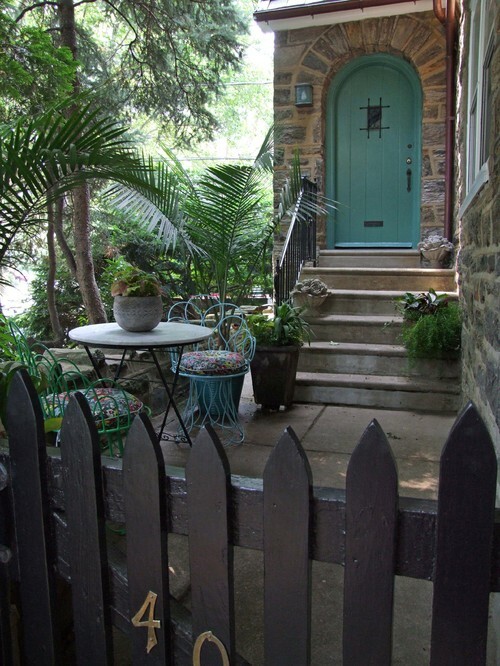 Design a secluded front entrance which not only offers up a cool vibe but gives the owner an opportunity to conceal and reveal other elements in the front yard, a tactic that makes smaller yards feel larger than they really are. 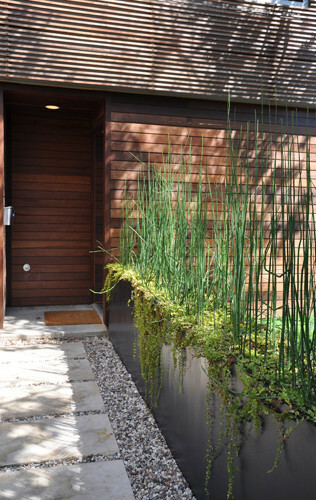 Use plants like giant papyrus (pictured above) in lieu of fencing. Avoid the temptation to plant horsetail, an upright plant with similar features. As beautiful as it is, even the best bio barriers and concrete planters won’t contain it. Trust me, it will spread into your neighbor’s yard, require massive amounts of poison and cause all sorts of problems. Some homeowners choose to make the front porch into a more private “room” by using these tall plants and hedges as walls. Decorative lattices serve as temporary walls until the plants grow tall enough. While plants do an excellent job of adding color, architectural elements in vibrant shades can really add a level of pop. It could be a pot, a piece of furniture, a funky mailbox or a front door refreshed in a new color. And, any color goes. From peach to neon green, all of it can work if you tie it together properly. While the blue-green door above isn’t a common front door color for a home of this style, the homeowner paired it with metal furniture in the same shade along with plants featuring the same tone. 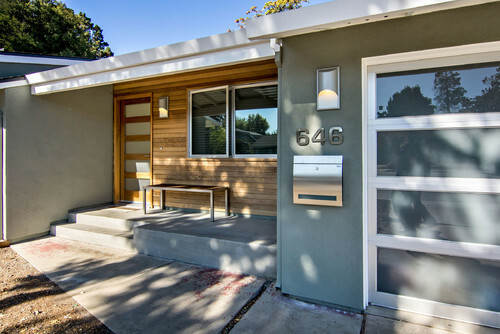 Midcentury Exterior by San Francisco General Contractors Bill Fry Construction – Wm. H. Fry Const. Co.
With all of the options on the market today, there’s no need for a bland mailbox. Whether it’s located in the porch area or by the street, a properly planned mailbox should echo your home’s design. This doesn’t mean a mini replica of the home–which some homeowners have done–but rather it should use the same elements that are present in the exterior of your house. If you’re having a mailbox custom-made or are creating it yourself, make sure to check postal regulations for proper sizing. If your home is modern looking, especially, adding wispy plants to soften hard edges adds to visual appeal. Papyrus, already mentioned above, over large bare walls is one strategy. Letting plants flow past their intended borders is another way. Creeping Jenny flowing over the sides of container plants and hanging baskets or raised planters, like in this photo below, is another way. Low maintenance concrete pavers alone provide a number of creative design options as do patterns utilizing other landscape materials. 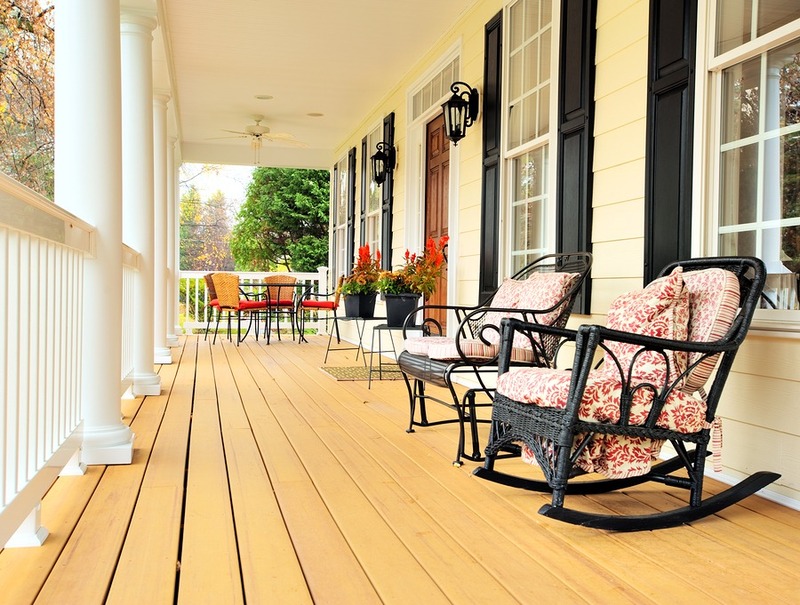 A perfect opportunity to incorporate geometric patterns is on the pathway leading up to the porch. It is often overlooked, which is unfortunate it’s often the first thing guests see as they walk toward your home. Jazz up an existing walkway by lining it with decorative rock, container plants or new border plants. Geometric patterns can also be incorporated on stair railings leading up or surrounding the porch or gates through which guests must enter. How do you decorate your front porch?